Everyone's getting amped up for SOTU -- after Obama's eloquence in Tucson, we're hoping it won't be the same old hope-y, change-y stuff we don't remember later (and not because of drinking games). Stay tuned for Paul Ryan's response -- the Budget Committee chairman is a natural Republican choice. Is there a rebuttal drinking game? Or will we be passed out by then? If you're playing by Queenie's rules from last year, and Obama talks about jobs like he should, you might be in the emergency room. What else is happening in snark-land? We've got your 411. AMA ZING! 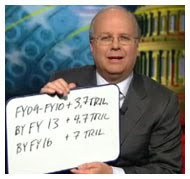 We finally have some concrete proposals from those deficit-hawk Republicans! We're just waiting to see how they're going to pay for those tax cuts WE KNOW are coming. They promised, right? The plan calls for a reduction of 15% of the federal workforce. One Republican congressman says that will "actually create jobs." Wait... what? As Obama meets with his Democratic Caucus colleagues today, we're hoping this and other Republican moves will bring our Dems together a little bit after that whole tax compromise thing. Hillary wants to return to private life, after decades of public service. No, we won't get those rumors started again. Got that, political pundits? And no real surprise here: Chicago will be the home of the Obama-Biden 2012 campaign HQ. Staff changes are also picking up. Michelle, Mitt (watch out for those Tea Partiers, dude), and Sarah...and Randall Terry -- this is going to be a wild ride. California Rep. Duncan Hunter is leading the charge to delay implementation of the repeal of Don't Ask, Don't Tell. Sure, that's a great way to spend the taxpayer's dime. A new GAO report out this week revealed the cost of DADT -- $193 million over five years. Duncan, buddy, are you just ignoring that or did it pass you by? 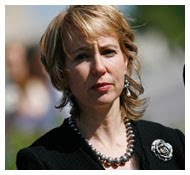 Rep. Gabrielle Giffords' condition was upgraded from critical to serious over the weekend and she is now able to breath on her own and stand up with some assistance. She was flown to a Houston hospital where she'll continue her recovery. The media, um, AGAIN didn't complete their fact-checking and ran with a story that Giffords could be removed from office during her recovery. 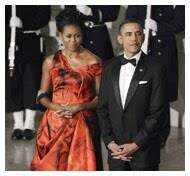 Obama hosted Chinese President Hu Jintao for a series of bilateral meetings this week (and a GLAMOROUS state dinner -- Michelle's dress was gorgeous, and who knew Hu was a Barbara Streisand dan?). The global economy, security, and human rights came up, of course. Nice dodge there, Hu. The Chinese leader also met with American business CEOs and made a quick trip to Chicago. Both leaders announced an export package worth $45 billion, including a $19 billion purchase of Boeing aircraft. Also, the pandas also can stay for a little while longer. White House staff are undoubtedly airing a sigh of relief as nothing TOO embarrassing happened. Well, there was Harry Reid... um, awkward. Oh, and Rush imitating Chinese, but we were all expecting that one. The GOP-lead House voted to repeal health care reform, despite long odds of overcoming a Democratic Senate and a presidential veto. Just look at the smiles on their faces! LOL at Joe Wilson. Getting a little ahead of yourself, aren't we. HHS says 129 million Americans under the age of 65 have pre-existing conditions. We're taking a guess that taking away the provision protecting these people is a bad idea! Also, Anthony Weiner (hear his top ten rants here!) hopes you guys and gals have a designated driver at the ready, after listening to some GOP nonsense. Oh, jeez, one Democrat had to mess it all up for us. So it ain't so, Joe! 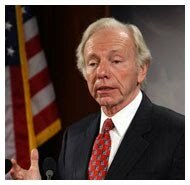 Joe Lieberman will not be returning to the Senate in January 2012. Though he most recently fought for the repeal of DADT, many liberals have been seething for years over Holy Joe's support for the Iraq war, opposition to the public option and his endorsement of McCain in '08. The later says he would make a great Pentagon chief. Folks are already lining up to succeed him. Oh, and we almost forgot -- some dude named Kent Conrad is retiring, as well. The Illinois legislature and governor approved a tax increase and that's given rise to a brutal fight between them and neighboring Wisconsin. Please, keep it civil, you guys! Alabama receives our attention, here and there -- always for the wrong reason. Yo, guv, maybe you should be more welcoming to your brothers. Regis announced this week that he's leaving Live! after 28 years on the air. Kelly is getting a replacement. Ouch, is Sarah really like Snooki? Which one should be offended? Both? A father-daughter duo have discovered Internet fame (the best kind) after releasing a video singing "Home" by Edward Sharpe and the Magnetic Zeros. Watch them on Ellen and don't blame us when your heart explodes. With love! Mamma mia! Berlusconi is in some trouble after probes into his philandering with minors (and his cell phone number) hit the presses -- this is his seventh scandal, y'all. Is he a sexaholic? Speaking of scandal... Todd Palin?! No waaaay. How much will it cost you to get The Bieber haircut? Oh, y'know, just a cool $800 or so. Oh, and he'd like you to also adopt a puppy. Why not. Biebs, if anyone from the PETA office approaches you with a couple of lettuce leaves, go hide behind your lawyer! 130 mobsters were arrested by the FBI today. Go team and all that, but we were more amused by their awesome nicknames. Special shout-outs to Jack the Wack and Meatball! The FCC approved Comcast's acquisition of NBC Universal. Critics of the deal say the merger will stifle competition and harm customers' access to content. Al Franken is not happy about the future of media dominated by just a few large conglomerates. 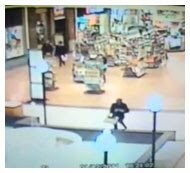 A lady in a mall was texting and walking and fell into a fountain. She is now, tragically, an Internet sensation. Did you get a look at all the official gifts the President has received from other dignitaries so far? There are quite a few great ones, although we didn't know it was in good taste to give people presents plastered with their own faces. Maybe Queenie should stop giving people medals and rugs with HER face on them... eh, who is she kidding? Everyone hates this guy, who got a million dollars just by creating a YouTube video and asking for it. And now you do, too! They say it ’s going to be wintry this weekend, so you might just want to curl up with some wine and catch up on your Netflix. The hardier among you might just want to take it easy - there is not a lot going on! Restaurant Week is extended in some places, and it’s still going in Alexandria, but you might be foodied out at this point like Queenie is. There’s also an okay-looking variety show but those are always hit or miss. We dunno - go hit the gym? Wanna see some journalists get funk-ay? Journopalooza is in town, folks, sponsored by Flying Dog. Advice: keep your mouth shut about your clients and your work, unless you want a story next week. They may be drinkin', but that doesn't mean their ears don't work. Ah, thank you, LA Times -- you've told Queenie which restaurants to avoid for happy hour in her native Old Town. Queenie was surprised and honored when she was approached by former Congresswoman Mary Jo Kilroy's Comm. team with an excellent blog post for Fem2.0. Please hop over and take a read -- her take on making a case for abortion and the future of women's reproductive rights is not worth missing. Tucson stayed in the news thanks to Giffords' utterly amazing recovery and Loughner's sentencing; rhetoric remained ridiculous (sarcastic thanks to you, Steve Cohen, for adding to the mess); and the health care monster once again has reared its ugly, ugly head. Given that this time last year we were discussing Democratic neutering and, uh, the arrival of iJesus, we'd say this is a step up. Get those livers ready, folks. See you next week!